Having been drawn into a fantasy world of his own creation, Rod Everlar continues his quest to defeat the corruption he has discovered within. He sets off in pursuit of the dark wizard Malraun, only to find that he has raised an army of monsters and mercenaries in order to conquer the world... "Best known as the creator of Forgotten Realms, the Dungeons & DragonsÂ®-based heroic fantasy series, Greenwood continues to give his audience exactly what they want." 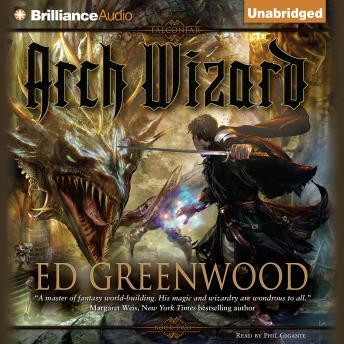 - Publishers Weekly "The richly detailed world of Falconfar might just convince you that Ed Greenwood, like the Dark Lord hero of this tale, does not create fantasy realms: he discovers them." - Elaine Cunningham, New York Times best-selling author. Funny in parts, naive in other parts. Lots of blood and body parts. Magic and trickery. Not a particularly good book all though I'm going to finish the series. So.....interesting enough.